For this week's blog, we're reflecting on one of our favorite patriotic weddings! Ellie and John celebrated their special day on a warm, sunny, and beautiful 4th of July. This vintage and romantic celebration of love will definitely leave you speechless! The venue, which is nestled in the Santa Monica Mountains, features a vineyard hillside, a simple and darling little farmhouse, and a large field of lush and green grass. Weddings on the 4th of July aren’t always easy. It’s always blazingly hot outside- but our flowers conquered the 95 degree heat, refusing to wilt and maintaining their beauty, Ellie & Rob said “I do” underneath the beautiful (and equally convenient) large oak tree. Flanking the sides of the ceremony site were two wine barrels. Atop these barrels were large floral arrangements with silver dollar eucalyptus cascading down the sides. We used a mixture of light creme and pink rose petals to create this aisle. Smilax garland along with smaller hand tied florals were draped along the aisle way. We personally stained the wooden arbor that created the backdrop for the ceremony site and love the way it came out! It totally matched the tuscan look provided by the ceremony chairs and the reception furniture. Draped across the front of the arbor was a large and breathtaking cluster of roses, greenery, and hydrangea. Ellie’s vision for her wedding required a unique fusion of color and texture. We went with a garden style bouquet featuring various blush and champagne tones (cue our gorgeous dahlias and garden roses). To create this blushing beauty, we used café au lait dahlias, Juliet garden & O’hara garden roses, champagne spay roses, pink astilbe, miniature pittosporum, and sprigs of silver dollar eucalyptus. Rob's boutonniere consisted of a simple spray rose and sprig of miniature pittosporum. The reception area simply would not have been the same without Stage Labs’ artfully strung lights. A Rental Connection’s Tuscana Collection brought a natural, dark wood tone to ground our light color palette while Luxe Linens provided a romantic lighter colored linen for our round tabletop designs. Rob & Ellie opted to have a head table rather than a sweetheart, so we staggered six large arrangements amongst dozens of glimmering votives and a long and dramatic smilax garland. To add a special touch to the bride and groom's chairs, we tied together smaller sections of smilax with rose blooms. Weddings like Ellie & Rob's make our job so much fun! Infused with spirit, love, and warmth- this event was one for the books! Romantic vineyard weddings, much like America, just never get old. We always love working with the team at Sterling Engagements and couldn’t have pulled this one off without them! A very special and warmhearted thank you goes out to Caroline Tran and Fiske Films for documenting this event so beautifully! Vintage romantic feel with blush, gradiation of light peach to dark peach and organic effortless style. Elli's lush bouquet was so special that it was featured on that will leave you speechless, we will combine textural flowers such as garden roses, white sweet pea, cafe a late dahlia, white ranunculus and mixed seeded euc, silver dollar euc and greens. The handle will be finished with a satin ribbon and stems showing. A artistic collective of a petite peach spray rose, seeded euc, blush astilbe. Stems exposed with a thin wrap of a champagne ribbon. Wristlets: Beautiful mini garden roses in ivory with mixed silver dollar and jasmine green accents. Satin ribbon bow. 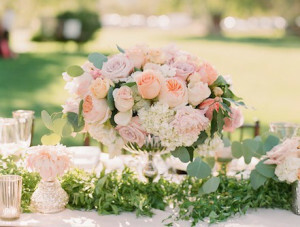 Round Tables: A low and lush design incorporating flowers such as pale pink roses and gradiation of peach roses, darker peach spray roses, white hydrangea, blush roses, white sweet pea, cafe a late dahlia, white ranunculus, silver dollar euc and variegated mini pit all nestled into a metal silver footed urn. Three silver and gold mercury budvases with lush floral selections of peach and blush garden roses will be intermixed within design. Finished with a petite collection of silver mercury votives and golden striped votives. Beautiful organic alter with wooden arch and beautiful fabric drapes in a whimsical and free-flowing style in shades of peach.